Learn to Speak English Fast - 5 GREAT Tips You Must Know! You are here: Home » Learn English Tips » Learn to Speak English Fast with These 5 Great Tips! If you want to learn to speak English quickly, there are 5 important tips that you should bear in mind before you get started. You should also remind yourself of these tips at regular intervals throughout your English language studies. One of the common mistakes made by people who want to learn to speak English is spending too many wasted hours perfecting and implementing their knowledge of English grammar rules. If you have been told that this is very important, the good news is that it is not and you would be wise to concentrate your efforts elsewhere. Studying grammar rules is fine if you are taking a specific English grammar test or exam but other than that it will only slow down your progress, confuse you and, worst of all, demotivate you. It’s worth bearing in mind that the majority of native English speakers never studied grammar rules at school, myself included. Whilst some could argue that this has had a detrimental effect on both written and spoken English amongst native English speakers, particularly younger generations, the point is that if becoming fluent in English is your goal, then beating yourself up over the rules of the past perfect tense and intransitive verbs won’t help you at all. When speaking English, native English speakers form sentences without thinking about grammar rules and your aim as an EFL student should be to do the same! Fluency should be your main focus rather than accuracy! If you want to learn to speak English it goes without saying that you are going to have to learn a lot of English vocabulary. The more words you know, the greater your understanding when reading English texts or listening to English speakers will be. Bear in mind though that is is not just about the number of words you learn but their relevance and usage. For example, learning the words water, bread and rice are far more important and useful than learning words like thermodynamics, onomatopoeia and indistinguishable. So, whenever you come across a new word, be mindful of how relevant that word is to you and how often you are likely to hear or use it. Also, simply memorising hundreds or even thousands of individual words will not help you to become fluent unless you learn the words in context. 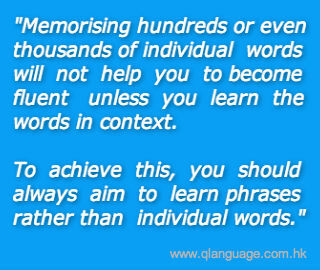 To achieve this, you should always aim to learn phrases rather than individual words. You might know hundreds or even thousands of words but not necessarily be able to form many sentences. However, if you learn just a small number of phrases you will be able to form hundreds of correct sentences. And once you’ve learned 50 to 100 phrases you will be amazed at how many correct sentences you can make. Take it one step further and learn 500 to 100 phrases and you will be virtually fluent in English. When forming an English sentence, you should avoid translating from your native language and, as mentioned above, avoid concentrating to heavily on grammar rules when you are speaking. It is more than likely that the word order and grammar will be completely different and doing this will simply slow you down. Again, learning English phrases and complete sentences instead of individual words will help you to avoid this. If you learn phrases and complete sentence you will not have to think too much about individual words and where they should sit within the sentence. Nor will you have to think too much about grammar rules. 4. Reading & Listening is Not Enough. Practice Speaking What You Hear! 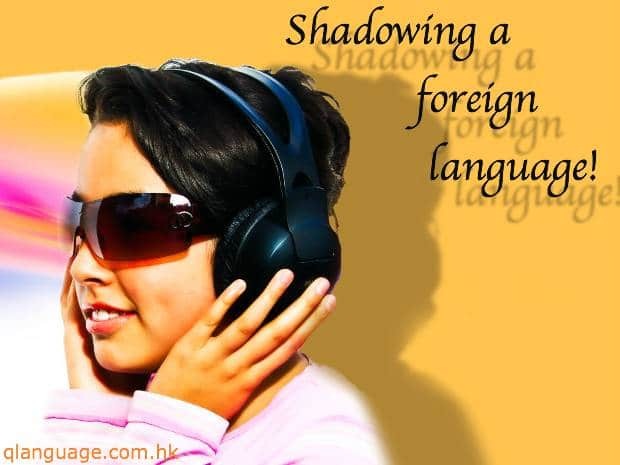 I have written about shadowing a foreign language before, but here is a great tip that summarises the technique nicely! It is an excellent way of ensuring that you get plenty of vital English speaking practice even if you are on your own. There is a technique known as ‘shadowing’ that I learnt in Japanese class, which I find tremendously helpful for short-term oral fluency improvement. Watch your favourite English language TV show or movie, and as the characters speak, repeat loudly the exact words they are saying the moment you hear them. In other words, ‘shadow’ their dialog in real-time. Don’t worry about getting every word or sound right – focus on listening carefully, moving along quickly and keeping pace. After the movie ends, repeat the exact same movie and do it again. And again. By forcing yourself to speak at native speed, your brain becomes hyper-receptive to what you are hearing, and you will find yourself not only picking up the words quicker and quicker, but also unconsciously mimicking the inflections and vocal nuances that are usually difficult to learn for a non-native. It will also fix the stammer that comes with uncertainty or lack of confidence. In this way, the actors in the movie become your speaking partners. This will be perfect practice just before your interview. Look for some interview practice videos on YouTube, then shadow the entire conversation. Practice the same dialogs again and again. You will be amazed how that will improve not only your speaking, but also your ability to actively listen and react. If you want to be able to speak English, you really do have to SPEAK ENGLISH! It’s not your fault but it is common place for schools across the world to teach reading, then writing, then listening and finally, as if it is the least important of all, speaking! Naturally, students get into the habit of concentrating on all other aspects of learning English and the speaking part tends to take a back seat. No wonder then, so many English language learners understand an awful lot more than they are able to communicate verbally. Many spend years studying English but they are nowhere near fluent speakers. During my years teaching English in Hong Kong I met many students who exemplified this. They had lived and studied English in either the UK, USA, Australia or Canada, some for many years, and yet their level of fluency was still quite poor. The reason for this is simple. Whilst studying overseas, they generally associated themselves with others from Hong Hong and spent the majority of their time communicating in their mother tongue (Cantonese Chinese). Simply put, they spent years NOT practising speaking English. Conversely, I have met students who have never stepped out of Hong Kong and yet their level of fluency is remarkable. Why? They studied at Hong Kong international schools where students speak English both in and out of the classroom – most of the time. So, if you are serious about becoming fluent in English you must practice speaking it regularly. You don’t even have to travel to an English speaking county to practice speaking English (although it really does help), you just have to surround yourself with people who are speaking English. Be sure, also, to set rules with friends and colleagues to only use your native language at certain times of the day. The rest of the time, speak English! Watch and listen to English TV, English movies, English podcasts and English radio. Live and breath the language and you will learn to speak English much, much faster. Being able to practice speaking the words with others is sooooo important! Good for you for mentioning it. In our schools we only allow English; helps with immersion and speeds up the learning process, for sure! This article is so good! It helps me to improve my basic English. I also try to practice your instructions. Thanks for nice blogging.